Some 3,000 years in the making, Armenian culture is a wondrous mosaic of human achievement in architecture, music, fine art, literature, mythology, philosophy, handcrafts, and cuisine. The unique nature of Armenian culture has always been fundamentally defined by Armenia’s geographic position, a fact that continues to function as a double-edged sword. On the one hand, Armenia’s prominent location on major global trade routes has had an enormously nurturing effect on Armenian culture, resulting in formative cultural exchanges, learning, and, ultimately, the continued growth of Armenian civilization. On the other hand, Armenia’s excellent location has made it coveted by and vulnerable to the designs of powerful neighboring empires and an almost unbroken string of invasions by nomadic hordes, which variously have sacked, devastated, or occupied Armenia, sometimes bringing Armenian culture to the brink of extinction. Thus Armenian culture has also at turns been marked by an ethos of victimization as well as a collective will to resist, regroup, and survive. A core factor in Armenia’s sense of victimhood has been the Christian faith, officially adopted by Armenia in the year 301, which has likewise been both a blessing and a curse in terms of the broader vibrancy of Armenian culture. While Christianity has inspired and engendered some of the most splendid and enduring accomplishments of Armenia, particularly in music, architecture, and manuscript illumination, it has also rendered Armenia an obvious prey to non-Christian empires. As importantly, Christianity has often had a morally, intellectually, esthetically, and politically paralyzing effect on culture in Armenia, forcing it, by dint of Biblical tenet, into submission, fatalism, a freezing of the imagination as a function of relegating human initiative to the will of God, and, consequently, long bouts of stasis. 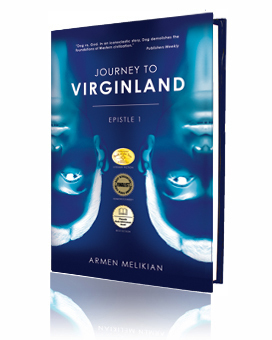 The pitfalls, prejudices, taboos, and inherently self-defeating mechanisms of Armenian culture are exposed to savage yet loving light in Journey to Virginstan, a new novel by Armen Melikian. An unapologetic product of Armenian culture, Melikian is also one of its most astute critics and an exhilaratingly erudite seer of its possible shape to come. In the best sense, I’m reminded of George Orwell’s classics, and other authors of similar stature, though there is no true parallel possible with a novel as unique in concept and execution as Journey to Virginland. Interested in learning more about Armenian culture? Get your copy of Journey to Virginland today!